Tampa Bay Lightning goalie Louis Domingue, stops a shot taken by the Flyers’ Wayne Simmonds, during the second period Saturday at the Wells Fargo Center. The Flyers were cooked Saturday afternoon. They trailed, 5-1, with less than 10 minutes left. Their penalty kill had been shredded for three goals in four attempts. The Wells Fargo Center was church-quiet. Five observations on Flyers’ loss to Devils: Will Brian Elliott’s injury affect Carter Hart? But in a comeback for the ages, the Flyers awakened their fans as they roared back and scored four goals in a stunning 6-minute, 4-second span to force overtime. Only to lose in the extra session. 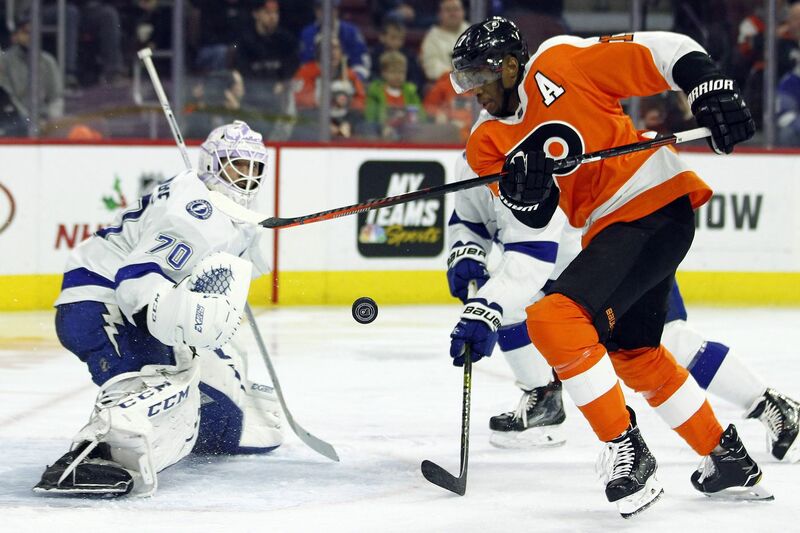 The Flyers picked up only a point because Anthony Cirelli spun away from Wayne Simmonds behind the net and scored the game-winner from the right circle with 3:13 left in overtime, giving powerful Tampa Bay a wild 6-5 victory. "We stuck with it," said Flyers left winger James van Riemsdyk, who had a goal and two assists in his second game since returning from a knee injury. "We showed some resiliency, and anytime you can get a point when your're down by four goals in the third, I'd say that's a pretty good thing." According to the NHL database, it marked the ninth time in league history a team had erased a four-goal deficit and tied a game in the final 10 minutes. In the last half of the third period, Travis Konecny scored twice, and Sean Couturier and Simmonds added goals. Simmonds tied it at 5-5 by putting a rebound past backup goalie Louis Domingue. Just 40 seconds later, Domingue stopped Dale Weise on a breakaway to keep the game tied. In a battle of backup goalies who were playing because of injuries to the starters, the Flyers outshot the Lightning, 45-26. Domingue made 40 saves, while the Flyers' Cal Pickard turned aside just 20 of 26. "We were all over them and played a hard game," Konecny said after his fourth two-goal game of his career. Konecny said coach Dave Hakstol came in after the second period and said the Flyers were "actually playing a good game" despite facing a 3-1 deficit. Tyler Johnson and Brayden Point (two goals) scored power-play goals 11 seconds apart in the third period to give Tampa a 5-1 lead. Point has five goals in the last two games. Late power-play goals by Konecny and Couturier got the Flyers within 5-3, and then Konency made it 5-4 by converting a pass by Giroux (two assists) with 4:02 to go in regulation. These numbers did not compute: Tampa (14-5-1) was outshot by 30-11 but had a 2-0 lead late in the second period. The Lightning struck first on Adam Erne's power-play goal with 13:58 left in the second. Erne (three points) took a perfect drop pass from Yanni Gourde and beat Pickard from the right circle. Pickard, in his first start since Nov. 8, was playing because Brian Elliott is expected to be sidelined at least two weeks with what is believed to be a groin injury. With 7:50 left in the second, Cedric Paquette took a feed from Erne and made it 2-0 by connecting on a one-timer from deep in the left circle. Van Riemsdyk scored on a rebound, his first goal in his second stint with the Flyers, to end their 0-for-15 power-play funk and cut the deficit to 2-1 with 5:27 to go in the second. Giroux had an assist on van Riemsdyk's goal, becoming the fourth player in franchise history to collect 700 career points. Later in the game, he tied Brian Propp for the second-most career assists (480) in Flyers history. The Flyers' momentum was short-lived. Just 2 1/2 minutes after van Riemsdyk's goal, Point took a crossing pass from Ryan Callahan and scored from the doorstep as he got position on still-struggling Ivan Provorov, increasing the Bolts' lead to 3-1. A neutral-zone turnover by Radko Gudas set the sequence in motion. The lead would grow to 5-1 before the Flyers made an epic comeback. "It's definitely a positive takeaway from the game. Never give up," defenseman Shayne Gostisbehere said. "I mean, we got a point out of it. I don't know if we had any business getting a point tonight, but it shows the true grit of our team." The Flyers Wives Carnival will be held at 11 a.m. Sunday at the Wells Fargo. … The Flyers had three power-play goals for the first time in 62 games.